Buying a ticket for a rugby match is becoming increasingly like paying huge money for a seat in a gigantic pub where many of the people are more interested in talk and drink than the action unfolding. Shame that touts were charging a reported €2,500 for the privilege of sitting in the Aviva yet many of the most dedicated fans were watching at home on Saturday. Ironic that sitting on a bar stool in a random pub or rugby club can now offer a better view, even a better atmosphere, than being in the heart of the stadium. Sad that the fantastic social occasion that is the Six Nations is now being diluted by corporate packages, and people who are more interested in social media posts than rugby posts. The lack of atmosphere during Ireland’s defeat against England has been a major talking point this week. The battle was lost in the stands, as much as on the field, it seems. Columnist Billy Keane noted that the Aviva looked almost empty 10 minutes before kick off, and appealed for the supporters to offer more. Certainly, the view on television as coverage began on Saturday evening had me checking my watch to make sure that there wasn’t another half an hour to go. The stands really did look barren. But I wouldn’t know for sure, because I chose to abandon thoughts of attending the Six Nation’s biggest fixture in person, and to watch on TV at home. It wasn’t just a financial decision, because for decades attending the Six Nations has been expensive, but seemed worth every penny. Rivalry, rugby, revelry and the famous roar. But it is becoming increasingly hard to deny that if you stay at home, the view will be better, the cheers will seem louder, and you can avoid standing up every two minutes to let someone head to the bar or bathroom. The atmosphere inside a rugby stadium these days can sometimes feel like a business meeting with added toilet breaks. For the last time I was at the Aviva stadium I spent over 10 minutes of game time listening to the loud conversation of the Munster man behind me. He wasn’t even talking to fellow fans surrounding him, nor was the match on his mind. He was on the phone to his builder. By the end of the conversation I knew the dimensions of his utility room by heart, but it was difficult to focus on the score. During a recent Friday night game under lights at the RDS I endured two banking bores loudly talking shop for almost the entire 80 minutes, a conversation that would be fine for a local restaurant or posh bar, where they could have nattered and glugged in happy conclave… but was just a tad distracting as Leinster launched a counter attack. Extreme examples maybe, but the chatting, drinking and wandering has become common enough among rugby crowds who were once vocal, vociferous and glued to the edge of their seats. Sure, a couple of pints has been a part of the match day ritual for many rugby fans and little has changed in this regard. But you wouldn’t touch a drop inside the stadium. That pint in the pub before the game, to help lubricate the vocal chords, has now become a constant flow of beer during the game, leading to a constant series of runs to the bar. Ever try to get to the bar in the old Lansdowne Road? You’d have had more hope single-handedly pushing the English pack over their own line. Most people just didn’t bother with the crush and the wasted time it would entail. Modern stadiums are different, designed to funnel crowds past drinks outlets, food concessions, television screens inside the stand. You needn’t even sit outside in the cold. You can munch a hotdog, sip a pint and stare at the nearest screen on the grey concrete walls, if you even want to bother checking the score in between bites and sips. While there is thankfully little in the way of boorish drunken behaviour, and the Aviva staff and stewards are always professional and friendly, the booze does bring the inevitable toilet breaks. “Sorry, sorry, sorry” the endless chorus as rows of seats pop up and down, with nary a nod to the action on the pitch. It’s hard to reconcile the cost of attending these matches with the lack of engagement among some sections of the crowd. Perhaps we’re all guilty of shortened attention spans, where 80 minutes seems like an age. Rugby is a stop-start game and once upon a time you had to learn to become engrossed in its intricacies (and yes, there are many) otherwise you’d be bored to tears. These days it’s different, for the mobile phone is always close to hand – if not already in hand. Selfies, Whatsapp, Instagram, and the rest of the internet are but a click away. On Saturday there were telling camera shots of Irish lineouts where it seemed more spectators were viewing through the lens of a mobile phone camera than actually watching live. If you’re going to view on a screen, then skip the cold and the queues and head to your local rugby club. You’ll get banter, beer and a better view for a fraction of the price. If you’re going to pay top dollar to watch the game, then please… watch the game. 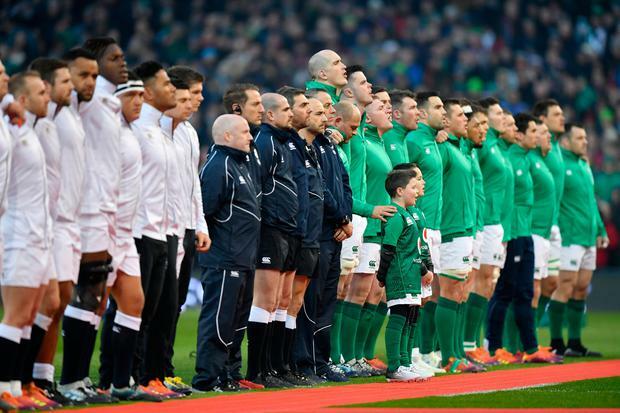 The onus is on all of us supporters – we certainly cannot blame the team, the IRFU, the stadium or the stewards here. Let’s treat a Test match as the sporting theatre it truly is. Let our texting fingers twitch aimlessly, let our thirsts build up to a much-anticipated post-match pint, and let our everyday conversations fade away into shouts and songs. Immerse ourselves totally. Just for 80 short and precious minutes. Attending a massive rugby match was always about more than the beers and the banter anyway. It was being part of something – the extra man – a ticket to a lifetime of memories and being able to say “I was there”. With many of the modern rugby crowd, they’ll certainly have the hangovers and the mobile footage to prove they were there. But what about the memories?